Salmon is a fish that has a moderately long body covered with tiny scales. Salmon live in the cold waters. Salmon spawn in a shallow clear and cold river water, and live in rivers and lakes. 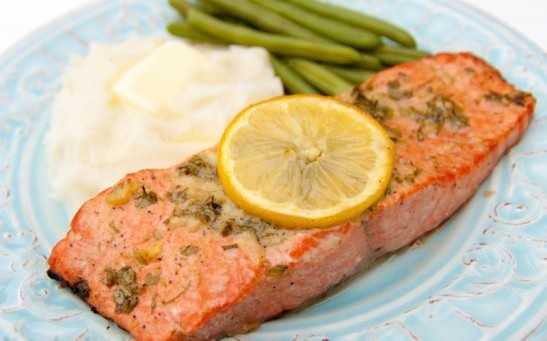 We recommend you to prepare this delicious baked salmon recipe. Time to prepare: 40 minutes. Place the salmon in pan for baking. Add the parsley in the water, boil it and then pour the salmon with that liquid. Then pour the salmon with olive oil, wine and spices. So now the salmon is ready for baking. Add the pan in preheated oven and bake for about 40 minutes, on 160 degrees C.